Alumnus Rob Harris ’77, G’79 has established the Rob Harris Fund for Student Immersion Experiences at the iSchool with a gift of $250,000. This gift will reduce program fee expenses for all of the iSchool’s domestic immersion experiences—Spring Break in Silicon Valley, EntreTech NYC, Peak2Peak (Seattle and Portland) and TechTrek Chicago for five years, and also enable the iSchool to offset other immersion program expenses to allow for the trips to provide more opportunities for participation and learning. Rob Harris ’77, G’79 speaks with students on the iSchool’s Peak2Peak immersion trip when they stopped to visit his company, Pacific Market International (PMI), in Seattle. Harris received his undergraduate degree in education, and his graduate degree in counseling, both from the Syracuse University’s School of Education. He is the founder of Pacific Market International (PMI), a global brand marketing and product innovation company focused on food and beverage containers. The company is headquartered in Seattle. Immersion trips at the iSchool got their start in 2011, with 12 students taking the first journey to the San Francisco Bay Area on the inaugural Spring Break in Silicon Valley trip. EntreTech NYC was launched in 2013, Peak2Peak in 2017 and TechTrek Chicago in 2018. 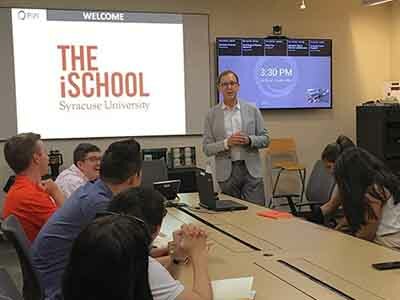 Since their inception, over 250 students from across Syracuse University have participated in one of the iSchool’s domestic immersion experiences. The registration period for the iSchool’s next upcoming immersion experience, Peak2Peak, is opening on Friday, Feb. 15. More information can be found at ischool.syr.edu/peak2peak. Information about all iSchool trips, both domestic and international, is available at ischool.syr.edu/trips.